The month of May will see two auctions at our Ravon Court HQ. The first on the 2nd May 2019. 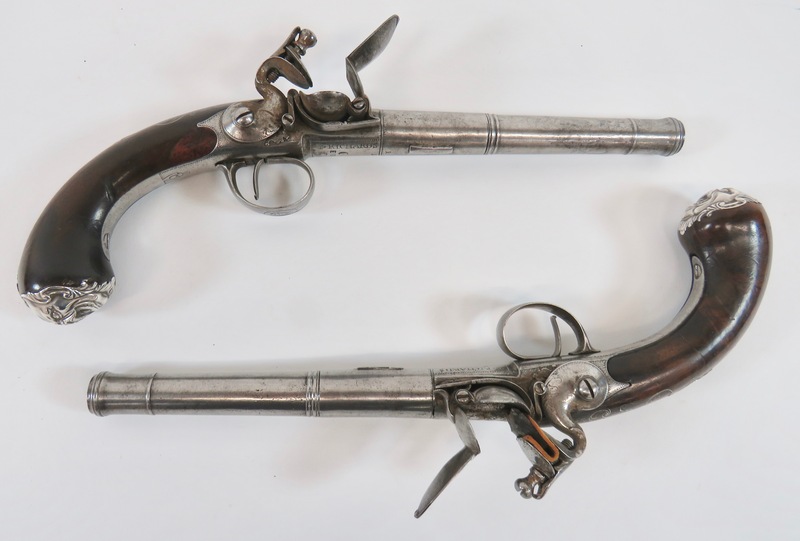 Gun collectors will be blown away with our selection of over 40 guns including a scarce 1759 pattern Elliot Light Dragoon pistol by “Vernon”, a late 18th century “Richards” double barrel Howdah pistol, a late 18th century “Mortimer” brass barrel blunderbuss with top mounted bayonet, a scarce pair of all steel Scottish percussion pistols with floral engraving to most parts, a fine pair of late 18th century Queen Anne flintlock cannon barrel pistols by “Richards”, a rare 1860 model Colt army revolver with fluted cylinder, a pair of Nock percussion over & under turn barrel pistols, a rare British Trafalgar period, Sea Service flintlock pistol. The deactivated gun section includes a 1938 dated English Bren, a 1928 pattern Thompson sub machine gun with drum magazine, a Russian PPSH41 sub machine gun with drum magazine, American Ruger silenced auto pistol, a German small ring hammer Mauser C96 pistol, and a Czech Skorpion sub machine pistol. There will be the usual large quantity of lots in the Badge section including a good selection of collar badges, Yeomanry, Cavalry, Infantry, anodised cap badges, cloth Formation and Airborne. Our second sale of May will be one of our biannual Collectors Auction and will take place on the May 30th which will include over 50 lots of Victorian and later Police truncheons. A superb collection of pond yachts and radio-controlled boats of all types, including German E Boat, British MTB and RAF Air Sea Rescue craft, etc. Over 180 lots of coins including Roman, Byzantine empire, German & Austrian Notgeld, and British coins. Large scale live steam locomotive and diesel engine shutter engine. Together with a varied selection of other items, with consignments still arriving it is well worth looking out for.